Here we can start seeing the shift towards an actual main plot as Princess Sally and the rest of the Freedom Fighters being thinking of taking down Dr. Robotnik once and for all. With a lot of background information and one of the best stories one-shot stories in the entire series, Volume 5 of the Archives is a strong collection of comics. Robotnik’s is on the search for one of his earliest robotic creations, King Gong, a gigantic gold-plated gorilla. 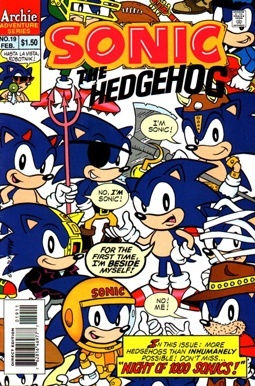 In a story reminiscent of Frankenstein, Sonic and the Freedom Fighters have to take down one of their biggest foes yet! The first part of a Sally side-story, Princess Sally Acorn reflects back on her current situation with Robotnik, her missing father, and a mysterious orb that has fallen from the night sky. – Gorilla Warfare or The Apes of Wrath is loosely based off the stories King Kong and Frankenstein. 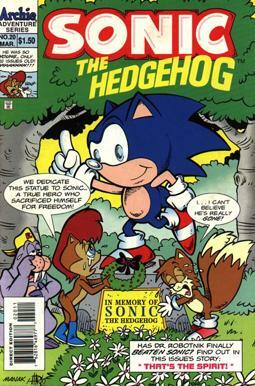 – In Sally’s side-story, we see the first appearance of King Acorn. 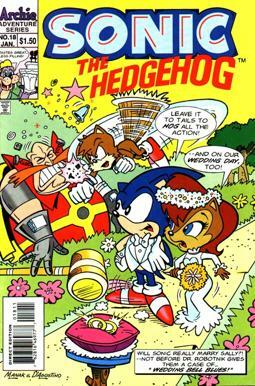 Sonic and Sally are finally tying the knot (or at least that’s what it seems), but not if Robotnik has anything to say about it! Rotor beings analyzing the strange orb that fell from the sky in the previous part of the Sally’s story. While the research continues, Sally gets some grim news from one of her childhood mentors and must deal with the passing of a good friend. A zone portal appears in Mobius and out of it pops a half-robot, half-hedgehog version of Sonic. 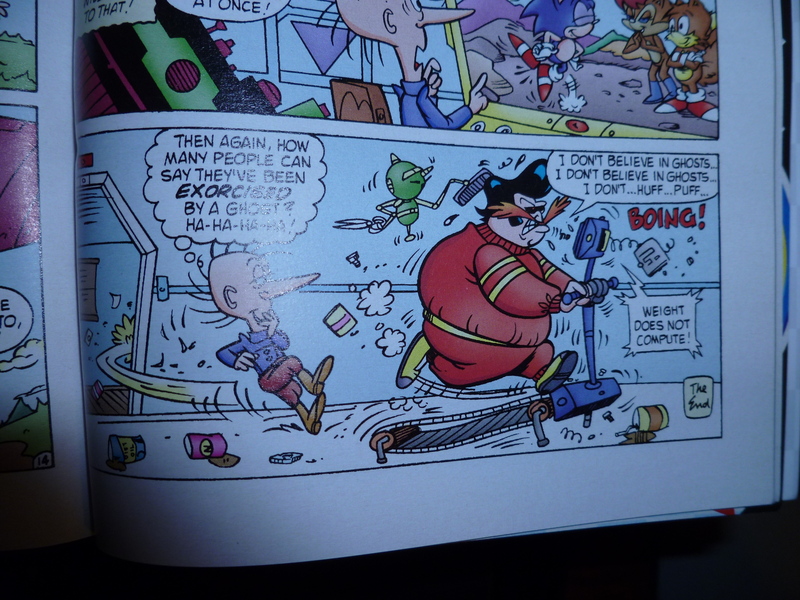 The robo-Sonic explains to the Freedom Fighters that in his dimension, Robotnik has used his roboticization machine on himself and turned into a powerful force that robo-Sonic can’t defeat by himself. Gathering up hundreds (perhaps a thousand, as the title suggests) of Sonics from different dimensions, the team of Sonic and other Sonic’s have to stop robo-Robotnik at all costs! 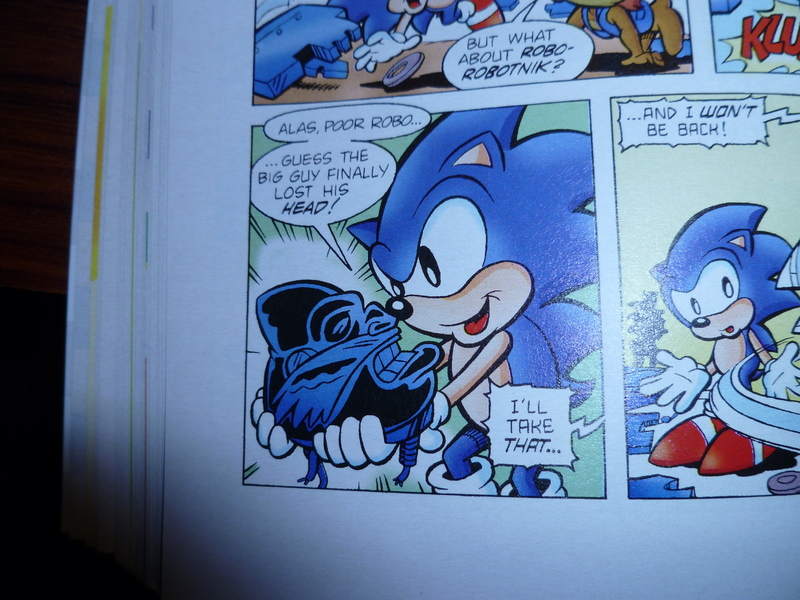 – There are lots of Sonic’s referencing other comic book characters, including a Wolverine-Sonic, Batman-Sonic, and Human Torch-Sonic. – Sonic once again travels on the Cosmic Interstate. A sign states that the next exit is 148,000 light years away. After a routine infiltration of Robotnik’s headquarters goes awry, Sonic is seemingly dead after a freak explosion of an anti-matter machine. 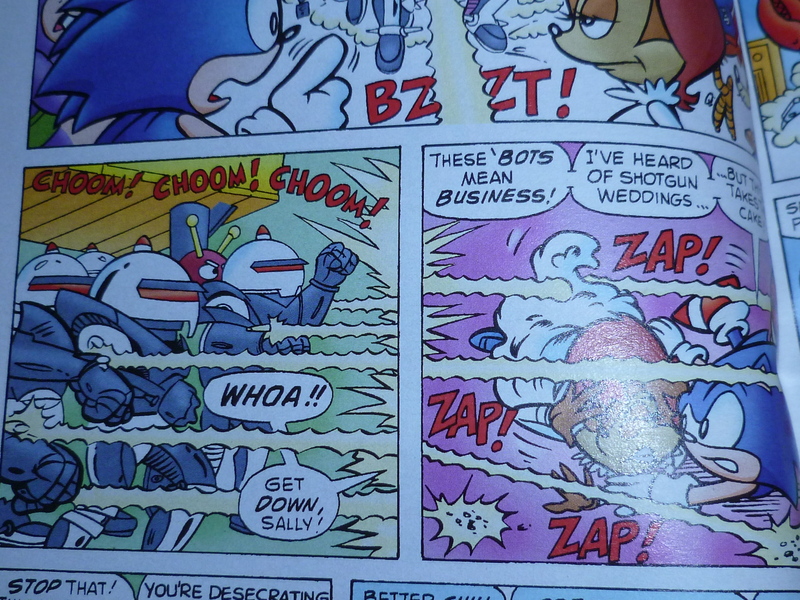 Sally barely escapes to tell the Freedom Fighters of Sonic’s tragic end. Robotnik thinks he has won, but a ghostly version of Sonic isn’t down for the count! Sally is off on her own with a special mission against the evil doctor. As the prologue to her own miniseries, Sally takes advantage of her new computer helper NICOLE, and meets up with Geoffrey St. John, the leader of a separate group of Freedom Fighters. Not every issue in this collection is a winner, but the inclusion of Night of 1,000 Sonics almost makes this worthwhile by itself. What really makes this archive standout is the beginning of something bigger: Sonic and pals are thinking of ways to finally defeat Robotnik, and a lot of key players for future issues are introduced, like Geoffrey St. John and the Rebel Underground, as well as Sally’s father King Acorn. The series is starting to get a lot more serious and stray away from the hijinks of the past. Sadly, this likely means the end of my “Most Punny Moment” but it had a good run while it lasted. 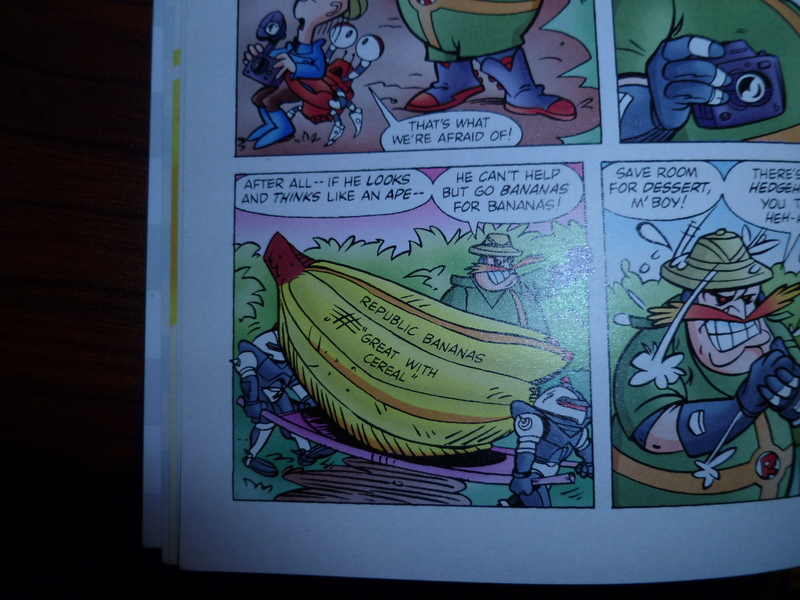 A few bonuses make this a bit better as well, including a never-before-seen comic included at the end of the volume! 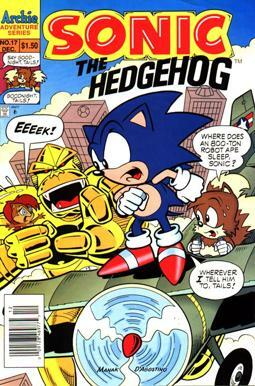 Involving the Universalamander from issues past, Sonic and crew take down the threat of Robotnik once again. Following this extra is a short Who’s Who, detailing King Acorn and Julayla. 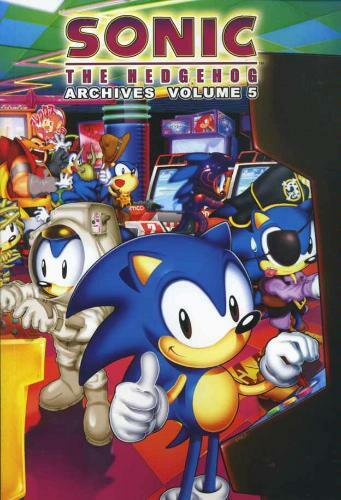 The cover of the volume has several Sonics as well as Robotnik playing games in an arcade. The visible games are all Sega games, including Astal for the Sega Saturn, Super Hang-On, and Alex Kidd.